Today, November 20, is International Transgender Day of Remembrance, an annual observance of the many transgender people around the world whose lives have been lost to violence, violence brought on because of anti-transgender ignorance, hatred, miseducation, and fear. Freedom for All Americans stands with the global community in remembering the lives that so many families and communities have lost. Transgender Day of Remembrance was started by Gwendolyn Ann Smith in 1998 as a vigil to her friend Rita Hester, a victim of violence. This became an important memorial that moved nationwide to become a poignant tribute to those who have lost their lives simply for being who they are. Transgender people also face disproportionate rates of discrimination, including at work, while searching for a home, while seeking adequate health and medical care, and while simply living their lives on a day to day basis. This discrimination often places transgender people in vulnerable situations, leading to increased, alarming rates of poverty, homelessness, harassment, and violence. These many forms of discrimination are connected, and as we remember the many transgender lives lost this year and throughout history, we must recognize that if we want to end anti-transgender harassment and violence, we must end anti-transgender discrimination in every sphere of life. Even on such a somber day, there remains great hope on the horizon. In 2018 we have seen such growth in understanding and acceptance of transgender people. Voters in Massachusetts and Anchorage blazed trails by securing the first-ever popular votes in the United States in favor of dignity for transgender people. A Republican-majority House and Senate in New Hampshire passed a transgender-inclusive nondiscrimination bill that was signed into law by a Republican governor. Three out transgender women were elected to serve in state legislatures, and one transgender woman even won a major party’s gubernatorial nomination. Perhaps most tellingly, when transgender people have come under attack by the Trump Administration, Americans from all walks of life have joined together and fought back, recognizing that no person should feel unsafe in school, be barred from serving their country, or be threatened with bureaucratic erasure. 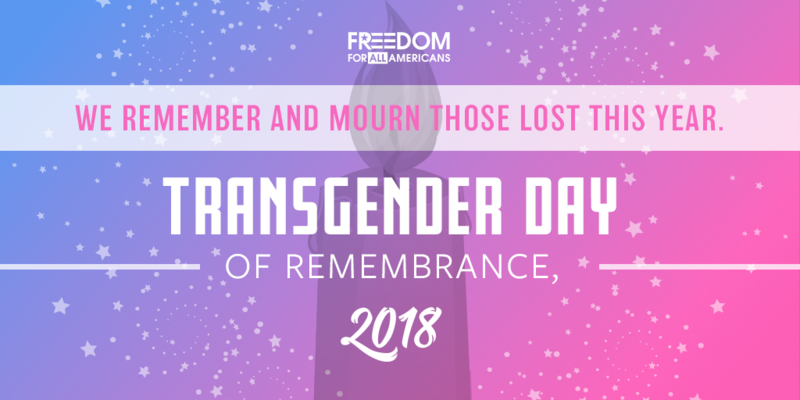 Today on TDOR, we remember the many transgender people who have been attacked, injured, and killed by a world that so often did not attempt to understand them. And today, we also take heart that there is a bright future ahead – and that, if we do the work, more and more Americans will understand, accept, and support dignity and humanity for transgender people nationwide. Last week, to mark Transgender Awareness Week, we took a look back at the year and shined a light on ways that understanding and acceptance of the transgender community has grown. Click here to read Part 1 (about policy victories for transgender people at the state and local level), check out Part 2 (about the #RainbowWave and historic electoral victories for transgender leaders), and read Part 3 (about how Americans have resisted the Trump administration’s anti-transgender attacks).